Come explore the Moon in legend & folktale, and as a world with conditions very different from our own! Explore the Moon in legend and folktale with "Toad in the Moon"
Understand why the Moon looks different during the course of the month with "Our Changing Moon"
"Sizing Up the Moon" lets everyone compare the relative sizes of the Earth and Moon, and surprises most people when they find out how far away the Moon is from Earth. "Moon Jump" is a great way to get bouncing kids to do some math! In "Crash Landing!," everyone gets to think about surviving in an alien environment. Contents: Leader Guide (includes all event handout masters/training videos), 20 Moon Balls, Moon Transparencies (for "Our Changing Moon"), Powdered Chalk (for "Moon Jump"), Getting Started in Astronomy Guide (with Moon Map) and Sample Take-Home Game. Full Leader Guide and game instructions are also available in Spanish. Contact Customer Service. 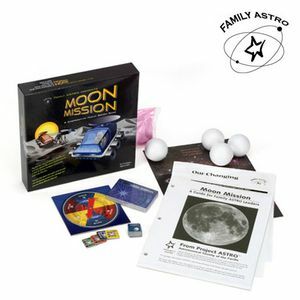 You may also be interested in purchasing the Take-Home game Moon Mission. Other kits in the series include Night Sky Adventure, Race to the Planets, and Cosmic Decoders available as Leader Kits and Take-Home games. At the heart of Family ASTRO is our series of Leader Kits that allow you to lead many fun and educational Astronomy Events for families, afterschool programs and clubs, and youth groups in your community (e.g, boys' and girls' clubs, Girl and Boy Scouts, park and recreation programs, etc.). For hands-on Family ASTRO training, educators may be able to attend a workshop at one of our participating Regional Sites. Visit the Family ASTRO web site to see if there is an official location near you.